After another full breakfast, this time overlooking the beautiful white beach on Berneray we decided to explore the rest of the island. It took us all of about 5 minutes to drive from the north east part of the island to the south west, where it was still raining. We donned our waterproofs and took a walk to see the birthplace of the Nova Scotia giant, then to the beach that runs the full length of the west coast of the island, the tide was in, so there wasn’t much beach to see, but it was really peaceful and the rain had stopped. We decided that we had fully explored Berneray and still had five hours before our ferry so after consulting the map we thought we would visit the three other islands to the south which were all connected by road. First was North Uist, where we stopped at a smokehouse in Clachan and bought some smoked salmon for lunch when we are back in Perth on Saturday, then continued south, past Benbecula to South Uist, where we stopped at Homore, which had some cute thatched cottages and church ruins to explore. By this time we were getting hungry, so turned back north towards Lochmaddy, stopping in Benbecula for a macaroni pie. The main road through the 3 islands was the A865, which wasn’t really a main road, most of the time it was a single track road, but the locals seemed good at letting faster traffic through, the A867 from Clachan to Lochmaddy was a bigger, straighter road which had just been resurfaced and it almost felt strange being able to use fifth gear in the Mazda, until cresting a summit to find sheep standing in the road, we were certainly still in the Outer Hebredies. While waiting for the ferry in Lochmaddy we took a stroll to the little hut of shadows, a camera obscura in a small building next to the loch, an interesting way to kill time before the ferry. The ferry took two hours to get to Uig on Skye, which instantly felt different to the other islands, much less remote and with bigger hills. 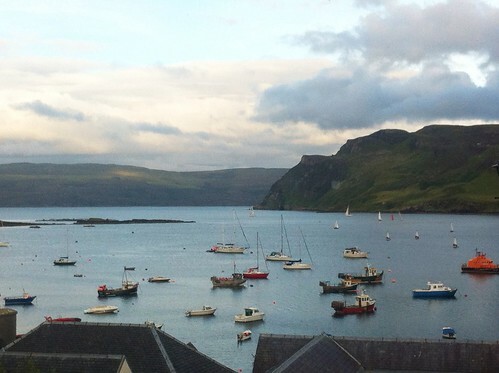 The drive to Portree was fairly short and it didn’t take us long to find our hotel, which had a great view over the harbour and over to Raasay, which made a change from white sandy beaches! This entry was posted in Roadtrips and tagged iPhone, Photo, Scottish Roadtrip by Lewis. Bookmark the permalink.